In a large nonstick skillet, heat oil over medium high heat. Season chicken with half of the salt and half of the pepper, and add to skillet. Cook until lightly browned, about 2 minutes per side. Transfer to a plate and cover to keep warm. In same pan add squash, zucchini, and tomato. Season with remaining salt and pepper. Cook and stir over medium-high heat until squash is crisp tender, about 3 minutes. Reduce heat, and return chicken to skillet. Cover, leaving a steam escape. Cook until squash is soft, and chicken is white throughout but still juicy, about 5 minutes longer. 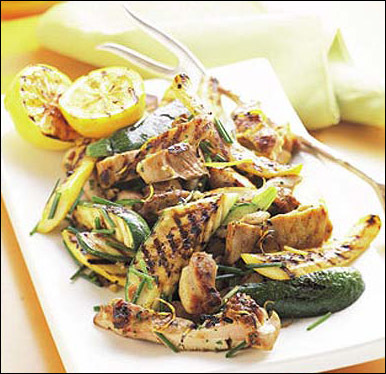 Transfer chicken to platter, arrange vegetables around chicken, and serve!